Lawmakers in the United States Senate have thrown a wrench in a plan that would have given President Barack Obama “fast track” authority to advance a 12-nation trade deal between the US and Pacific Ring partners. In a 52-45 vote on Tuesday afternoon, the Senate opposed moving forward for now on the Trans-Pacific Partnership. A procedural vote required at least 60 “ayes” in order to let the Senate host discussions on whether or not to give the president so-called “fast track” authority on the matter. Failure to reach that threshold puts the future of the trade agreement in jeopardy. Had the vote gone the other way, lawmakers would have hosted a debate to decide whether to give President Obama the power to approve the potential deal on his own, before asking Congress to either ratify or reject any agreement. Ahead of Tuesday’s vote, Senator Orrin Hatch (R-Utah), the chairman of the Senate Finance Committee, told Reuters the possibility of expediting the process as the White House had requested “may be dead” due to lack of support soon after the procedural vote failed. BREAKING: Senate votes to block advance of TPP Fast Track bill amidst growing opposition to secretive anti-user trade deals. 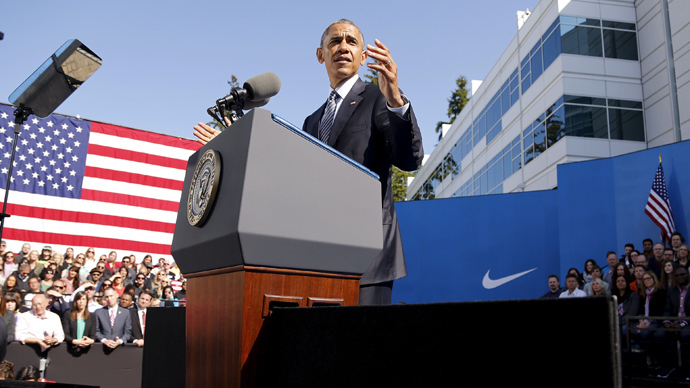 President Obama has been touting the TPP as a catalyst for the domestic jobs market and an enabler of workers’ rights abroad, and last week he pitched the deal at the main office of footwear giant Nike. “If I didn’t think that this was the right thing to do for working families then I wouldn’t be fighting for it,” Obama told the crowd at Friday’s event. In the wake of the vote, Obama met with Senate Democrats in order to try and chart a path forward that would allow more Democrats to drop their opposition to the legislation. "The president convened a meeting today with Senate Democrats, including members who have publicly indicated their support for advancing a TPA bill, to discuss a path forward for this legislation," an unnamed US official told Reuters. Hatch, meanwhile, said it could be another day or two before a new version of the fast-track bill comes to a vote, as lawmakers debate over which amendments to package. But while the White House says passage of the bill would encourage businesses in the US and put in place much needed labor regulations in partner countries, critics have taken aim at the backroom negotiations involved in drafting the deal, which have largely prevented details from becoming public. In seeking fast-track authorization, the White House had hoped to be given blanket approval by Congress in hammering out multinational trade deals. Only after an agreement is reached would lawmakers be allowed to weigh in by either voting for or against the measure. Meanwhile, public disclosures about the in-the-works agreement have been few and far between, and in many instances provided by the anti-secrecy group WikiLeaks. Earlier on Tuesday, Senator Barbara Boxer (D-California) raised concerns on the Senate floor over the Obama administration's lack of transparency with regards to what’s being discussed by TPP participants. “Let me tell you what you have to do to read this agreement. Follow this: you can only take a few of your staffers who happen to have a security clearance — because, God knows why, this is secure, this is classified. It has nothing to do with defense. It has nothing to do with going after ISIS,” Senator Boxer said, according to the Intercept. TPP partners currently include the United States, Japan, Mexico, Canada, Australia, Malaysia, Chile, Singapore, Peru, Vietnam, New Zealand and Brunei.